On the eastern Carolina coast there is a “hidden gem”, nestled between Wilmington and Myrtle Beach, with breathtaking views and one of the best courses of the area. Locals call this gem “Lockwood Folly“. Along the southern coast of North Carolina, this Willard Byrd championship-designed golf course will offer 18 holes of challenging golf. The Lockwood Folly River feeds into the intracoastal waterway providing a serene wetland, home for many species of birds and moss-covered hardwoods. You will experience secluded fairways that demand your attention, while a pleasant atmosphere sets you at ease. With many awards from Golf Digest and Myrtle Beach Golf Magazine, this membership owned course has everything the avid golfer desires. Not a Golfer? Lockwood Folly Country Club has amenities for you too. For the boater, there is a private community boat dock and boat launch. You can be in the intracoastal or the Atlantic in minutes. A spacious clubhouse equipped with a pool and hot tub has a spectacular view of the Lockwood Folly River and the Intracoastal waterway beyond. Waterfront picnic areas are a great place for family gatherings. Tennis anyone? Lockwood offers that too. Fresh seafood is another great aspect of this area. Travel 10 minutes to Varnamtown to see boats bring in fresh seafood. You’ll want to pick up a peck of oysters while your there. Mr Varnam is famous for his oysters in our part of the world and can tell you all about the history of this quaint waterside community. Fine dining and casual dining abound in and around the community. The “Tin Cup Cafe,” near the golf course’s fifth hole, is a great place to discuss the traps and water hazards of the course. With juicy burgers, crabcake sandwiches and unusual salads, the menu will satisfy everybody in your group. Five minutes away, you have a variety of seafood restaurants on the Holden Beach Causeway and the famous Paradise Cafe on the Island. Or, for fine dining, visit Captain Pete’s Restaurant on Holden Beach, and enjoy the beautiful sunset over the waterway while you dine. For more casual waterfront dining, try Betty’s on the Waterfront or The Provision Company. Both are accessible by boat or car. Of course, you are only 40 minutes away from 100’s of options in Wilmington or Myrtle Beach. 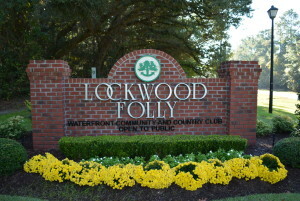 Lockwood Folly Country Club is a 500 acre gated community offering a variety of home styles. Luxury homes, patio homes, townhomes and condos are all available. CENTURY 21 Anne Arnold knows this area well and will be happy to show you the best of the homesites or existing homes. With lakes and ponds, woodlands and the Willard Byrd golf course, you will have incredible views from every window.